Although both Theravāda and Mahāyāna Buddhism exist in Vietnam, the kind of Buddhism that is most influential and most widely practiced by the majority of Vietnamese Buddhists is Sinitic Mahāyāna Buddhism. Indian and Chinese scholastic traditions have had little if any impact, while Chinese Chan and Pure Land are the only major schools that provide philosophical and religious foundations for the ideas and practices of Buddhism in Vietnam. Incorporation of popular religions and Vietnam’s political involvement with China and France were also instrumental in shaping certain characteristics of Vietnamese Buddhism. Evidence indicates that Buddhism had come to Jiaozhou (as Vietnam, a Chinese protectorate, was then called) by the 2nd century of the Common Era. Scattered hints in Chinese history inform us that Buddhism in Jiaozhou was consistent with the cultural and religious influences to which the religion was exposed in the 1st millennium C.E. The presence and activities of figures such as Mou Bo (2nd century C.E.) and Kang Senghui (3rd century C.E.) were indicative of the integration of Jiaozhou into the cosmopolitan Buddhist world of the time. By the late 6th century C.E., Buddhism was already a part of the cultural and religious life of many people in Jiaozhou. Monks from various parts of Asia were regular visitors to Jiaozhou, and they contributed to Buddhist studies and activities there. They also inspired native monks to go on Pilgrimage to India or China to study the Dharma. visits to China by monks from Vietnam, or Chinese and Central Asian monks who stopped in Jiaozhou on their way to India. In addition, monks from Jiaozhou who made prolonged stays in China and India were well versed in Sanskrit and they assisted Indian and Central Asian monks in translation work. By the time Vietnam gained independence from Chinese political hegemony in the 10th century, Buddhism had existed in Vietnam for nearly a millennium. The early Vietnamese dynasties found in the Buddhist clergy a cultural force that could assist them with their political agenda. The founder of the Dinh dynasty (968-980) instituted a system of hierarchical ranks for court officials, Buddhists monks, and Daoist priests. This indicates that Buddhist monks already held a recognized place in the social and cultural order of Vietnamese life, requiring the Dinh dynasty to integrate Buddhism into the structure of the state. The Ly kings continued to draw support from Buddhism, and in return they patronized Buddhism on a large scale. Eminent monks served at court and exerted great influence in political matters. The Ly kings also sent envoys to China to bring back Buddhist texts so that copies could be made and placed in the major monasteries. Some Chan classics, particularly those of the chuandeng lu (transmission of the lamp) and yulu (recorded sayings) genres, found their way to Vietnam and attracted the attention of learned monks. In brief, under the Ly, Chan became an integral part of the Vietnamese Buddhist worldview. Under the Trān, Chan learning became more established with the arrival of Chinese Chan monks and literature. Among their disciples were members of the Trān aristocracy, including the kings themselves. The Truc Lam Thien (Chan) School, the first Vietnamese Chan Buddhist school, was founded by Trān Nhan Tong (1258-1309), the 3rd king of the Trān dynasty. Unfortunately, only fragments of writings by the first 1-3 patriarchs of this school are extant: Through these writings we can see that Truc Lam Thien modelled itself on Chinese patriarchal Chan. The most extensive Buddhist writing from the Trān is the Instructions on Emptiness composed by Trān Thai Tong (1218-1277), the founder of the Trān dynasty. The Instructions on Emptiness was the first collection of prose works on Buddhism in Vietnam. It includes essays written in different literary styles on a variety of subjects on Buddhist teachings and practices. The author portrays Vietnamese Buddhism as the offshoot of Chinese Chan, an approach that left indelible traces on subsequent generations of historians of Vietnamese Buddhism. Under the Ly and Trān, civil service examinations based on the Chinese classics were given to select men who were chosen to serve at court. This created a Confucian intelligentsia who became extremely influential and rivalled the influences of Buddhist monks. The Ly kings were ardent supporters of Confucianism and they passed restrictive measures on Buddhism, but they continued to support popular Buddhist activities. The period of the Northern/Southern division (1528-1802) was one of political turmoil, but Thien (Chan) Buddhism was not idle during this period, and there were efforts to revive Truc Lam Thien. Chinese Linji and Caodong monks also came to Vietnam to teach, and several new Thien schools were founded. The most influential were the 2 Linji sects: the Nguyen Thien and the Lieu Quan in the south. The Nguyen kings considered Confucianism to be a useful force in their efforts to centralize power, and there was an attempt to depoliticize Buddhism because it was considered detrimental to the Confucian hierarchy. Although the majority of court officials were Confucian and were averse to Buddhism, Buddhism was still appealing to aristocratic women and did not lose its grip on the masses. Buddhism also exerted great influence on some of the most eminent literati of the time, and the Nguyen was a period of ardent Buddhist scholarly activity. However, the contributions of eminent monks of this period consisted mostly in compiling, editing, and publishing texts. Vietnam was under French rule from 1883 to 1945, and French dominion presented new pressures for the Vietnamese Buddhists. intellectual Vietnamese Buddhists were inspired by reformed movements in other East Asian countries in the 1920s and, in particular, by the Chinese monk Taixu (1890-1947). Buddhist magazines and periodicals in colloquial Vietnamese began to appear with a view to addressing political and social issues. There were attempts at consolidating the 3 associations into a unified Saṅgha, but the efforts were hindered by the repressive policy of the French and a lack of communication. When Emperor Bao Dai (1913-1997) assumed the role of head of state of South Vietnam he signed Decree No. 10, which followed the French policy of relegating all religions to the status of “public associations,” with the exception of Catholic and Protestant missions. On assuming power in 1955, Ngo Dinh Diem (1901-1963) retained Decree No. 10. In 1957 Diem also eliminated the Buddha’s birthday (Vesak) from the list of official holidays. Diem’s policy toward Buddhism led to many Buddhist resistance movements during the 1960s, which ultimately resulted in the overthrow of his government and inspired a Buddhist revival. The Vietnamese Unified Buddhist Church was founded in South Vietnam, Van Hanh University, the first Buddhist University, was established in Saigon, and eminent monks such as Thich Tri Quang and Thich Tam Chau became household names. A charismatic young monk with an American education, Thich Nhat Hanh (1926- ), the founder of School of Youth for Social Service at Van Hanh University, became an overnight celebrity. However, due to inexperience on the part of the monks, division among the leadership, and a lack of a capable lay elite class, Vietnamese Buddhists failed to seize a rare opportunity to reform and explore the potential of Buddhist culture in their country. Vietnamese refugees began migrating to Europe and North America in 1975 in the aftermath of the fall of South Vietnam. In a relatively short time many temples were built as part of the emigrants’ efforts to preserve their Vietnamese way of life. Buddhist practices at most such temples continued the patterns the patrons had followed in Vietnam. 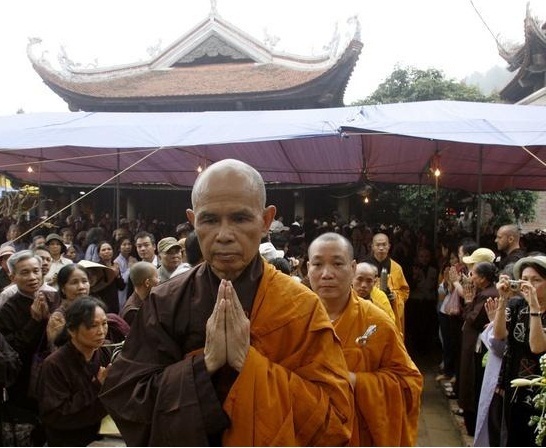 However, there has been a renewed interest in Thien in the West, inspired by the popularity of Thich Nhat Hanh. Some eminent Thien teachers such as Thich Thanh Tu (b. 1924) have been invited to the United States to give instructions on Chan meditation. Little change or sectarian development has taken place in the practice of Vietnamese Buddhists since medieval times. This is probably due to the limited repertoire of Buddhist literature to which the tradition has been exposed. In brief, Vietnamese Buddhism is basically non-sectarian, and most Vietnamese Buddhists - cleric and lay - regardless of their intellectual disparities, practice a composite form of Buddhism that runs the gamut of popular Buddhist practices in other East Asian countries. Although most clergy and educated lay Buddhists maintain that Vietnamese Buddhism is predominantly Chan with elements of Pure Land and Tantra, Chan elements actually figure very little, if at all, in the practice of most Vietnamese Buddhists. - those that involve lay participation. The first group of practices includes ritual ordinations, religious disciplines, monastic rituals, accession ceremonies, and summer retreats. The second group consists of religious observances and rituals that occur on a regular or occasional basis. taking the Bodhisattva precepts, taking the 8 precepts, participating in prayer services for peace and for rebirth in Amitābha’s Pure Land, engaging in repentance, and freeing captured animals. Among these practices, praying for peace for the country and the world can be an individual or communal act. Repentance is a liturgy that takes place in the evening twice a month at the full moon and new moon. It consists of, among other things, the recitation of the names of108 Buddhas and bowing each time a Buddha’s name is recited. Freeing captured animals is one of the ways to accumulate merit, an essential element of Vietnamese Buddhist practice. It is fair to say that most Vietnamese Buddhists are more concerned with accumulating merit than with cultivating wisdom. The most common forms of merit-making are contributing to the printing of Buddhist books, to the building and upkeep of temples, and to the support of monks and nuns. Also included in this category of special practices are ceremonies and festivals that incorporate elements of folk beliefs, such as the New Year festival and the Ullambana festival celebrating filial piety and commemorating past ancestors. These festivals and various death rituals involve the widest participation of the populace, including those who are only nominal Buddhists. The most essential regular practice is daily chanting, which consists of 3 intervals of service performed at dawn, noon, and dusk. This practice includes chanting Sūtras, reciting Mantras and Dhāraṇī and Buddhas’ names, and circumambulation. The 3 most chanted sūtras are the Heart Sūtra, Lotus Sūtra (Saddharma-Puṇḍarīka-Sūtra), and Amitābha Sūtra. Meditation is also an integral part of the Buddhist program of practice in Vietnam, and tends to include sitting quietly contemplating the magnificence of Amitābha Buddha’s Pure Land or mentally reciting the names of Buddhas and Bodhisattvas. Most monks, nuns, and a number of laypeople sit in meditation occasionally, only a few regularly, but not every Vietnamese monastic is an adept in meditation.